Modi isn't going to voters on his track record, but on the fear of the terrorist across the border and the Muslims within. It's a battle on his terms, says Shekhar Gupta. The most obvious question an incumbent seeking re-election should be asking his voters is: Are you better off than you were when you voted me to power? For Narendra Damodardas Modi it could rather be: Do you feel more secure than when you voted me to power? If the answer is 'yes', you can't expect to ride to a second term on an upsurge of insecurity. If it is 'no', why should the same people re-elect you? In the Modi world, however, a third possibility can be created. Are you feeling less insecure than you did, probably, in the week of 26/11 in 2008? A conventional politician goes back to the voters on his own track record. A cleverer one does so on his rivals'. Mr Modi is anything if not clever. You can quibble on detail, but the Modi government is right to boast that in its five years there has not been a big terror attack outside Kashmir, in what we may call for convenience as mainland India. Barring two failed strikes in Gurdaspur and Pathankot, both within miles of the Punjab border, Pakistani groups have not been able to hit anywhere else. Never mind that the preceding five years under the UPA were quite safe too, and Kashmir quieter, because even the Congress has forgotten that. Mr Modi isn't even building a campaign on his own successes on national security. He is, instead, building further insecurities. It is like, read my lips, after me, the deluge of Jaish, Lashkar and ISI terror. In 2014, he won on the promise of hope. Five years later, he wants another term on the threat of dark terrorist fears from Pakistan. Anybody opposing him, especially the Congress, is in cahoots with Pakistan. That is why he says that only terrorists and Pakistanis want him defeated. In the same breath, he also accuses his opposition of having been soft on terrorists, of daring to demand evidence of success in his cross-border raids and disrespecting the armed forces. What does this shift from the optimism of 2014 to fear in 2019 mean? The Modi-Shah BJP believes in what we may calls 'total politics' -- where politics becomes your only avocation, entertainment, obsession and addiction 24x7, and when winning power is no longer confused with the trust that holding public office usually implied. Today, you use any method to get public office. Then we shall see what we can do with it. So, if you can artificially conjure up a paranoia, it is sharp, useful politics. On the other hand, going for re-election on your five-year record is dangerous. Because people then check your claims with their reality 'today'. You can hide all data on jobs and fix GDP calculations. But once you ask people how they feel, they will make an immediate reality check. In any case, no matter how many may have benefited from your schemes, toilets, Mudra loans, Ujjwala LPG connections, agricultural support direct transfers, power connection and so on, the number of those left out will still be greater. You want to know how dangerous it is? Ask L K Advani about the 'India Shining' campaign of 2004. 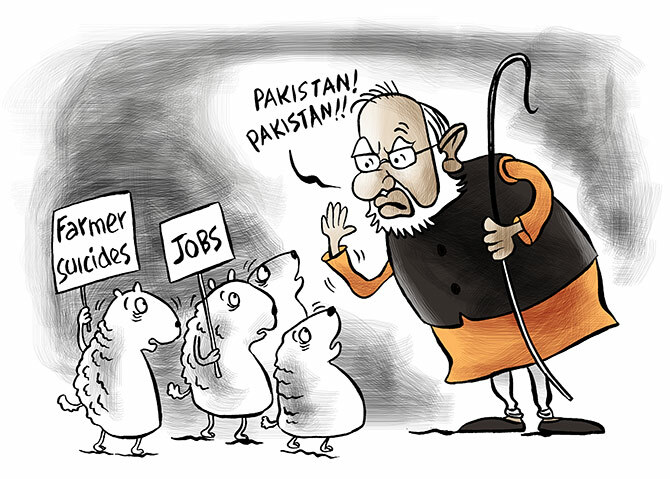 Mr Modi's early speeches have indicated the things he will talk about: Pakistan, terrorism, corruption, and the lack of nationalism of his opposition and critics. And things he mostly won't: Jobs, growth and agricultural stress. What this means is, he is setting this election up so he doesn't have to defend himself against the charges the Opposition throws at him. He will, on the contrary, attack them. Terror, read with Pakistan, has another subtext: Muslims. Mr Modi and Amit Anilchandra Shah won in 2014 by 'othering' the Muslim. They ran a power structure -- Cabinet, top Constitutional and administration positions -- where Muslims were excluded to the extent of being disenfranchised. They won a majority in the Lok Sabha, fielding just 7 candidates from this country's 14 per cent Muslims and, then, a massive landslide in Uttar Pradesh where almost 20 per cent of the voters are Muslim -- without fielding a single Muslim. So successful has this strategy been that today the Congress is even shy of contesting the BJP on this mass exclusion for fear of being called a 'Muslim party'. Seeing an ideological breach there, there is no surprise that Mr Modi would try to widen it. That is why: Pakistanis and terrorists want me defeated. So does the Opposition. And what's their most solid vote-bank but the Muslims? So, repeat after me, terrorists, Pakistan, Muslims. And again. If the Muslims won't vote for me, good luck to them. The Hindus will unite against them. It won't work if I build this campaign directly against fellow Indian Muslims. So, the danger has to be from the Muslim alien -- the Pakistani and 'pro-Pakistani' Kashmiris in the heartland and the west; Bangladeshis in the east. Mr Modi is not unique in this approach. In democracies across the world now, beginning with Donald Trump, mass leaders are learning to talk only to their base, make fear the rest, and marginalise them. From Mr Trump to Mr Erdogan to Mr Netanyahu to Mr Modi, they also use some combination of the same elements to build a fear-complex among their majorities, as if they were in fact the minority in their own country. Check out Mr Trump and Mr Modi: There is an enemy outside the borders (illegal immigrants for Mr Trump), there is a bigger enemy within -- the Left-liberals, minorities, opposition and the free media, the 'compulsive contrarians', I came from nowhere to challenge the entrenched, entitled classes. What the Washington Beltway is for Mr Trump is Lutyens for Mr Modi. I am the first truly smart choice you've ever made, everybody before me was an idiot. History begins with me. But you've seen nothin' yet. Give me just one more term. You can laugh at this. But it won't help you defeat Mr Modi because his sizeable base loves it. Where does it leave the Opposition? If Mr Modi can keep his own base together, and the rest divided, he is home easily. The Congress cannot fight him on corruption, given its own reputation, and national security, where Mr Modi's rhetoric is unmatchable and fortified by the recent strikes. Every time an acknowledged Modi critic questions his claims on the strikes, it will make it tougher for the Congress to even join the debate. Mr Modi has, therefore, got two things right early on. A divided Opposition, and a battle set up on his terms. With its minimum basic income, or the NYAY move, the Congress has at last demonstrated a resolve to shift the battlefield. Its promise of Rs 6,000 per month is more than Mr Modi's Rs 500 to small farmers. Further, it is traditionally seen to be a more welfarist party, just as the BJP is seen to be more nationalist. There is much joblessness and farming distress, and far too many people are unhappy for this not to find some traction. The question is: Does the Congress have the reach, skill, resources and time to force Mr Modi to respond to this issue instead of what he would prefer? Even if it does, it has no roots left where most of India's poorest live: West Bengal, Odisha, eastern Uttar Pradesh and Bihar. But NYAY has an interesting ring to it as a political idea. There might still be a few days left for it to stitch up some alliances and give Mr Modi a real fight instead of a walkover.